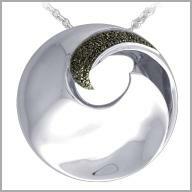 Sterling Silver Black Diamond Circular Swirl Pendant w/ Chain.Price includes 30% discount. Express yourself with a signature style created by Sonia Bitton. This sophisticated pendant is crafted in polished sterling silver. A dramatic swirl envelopes the top of the design with 43 full round cut black diamonds in prong settings. The total diamond weight is approximately 0.34ct. It measures 1-15/16" x 1-15/16" and includes an 18" curb chain with a lobster claw clasp. I purchased this pendant and was very surprised with the weight of the silver and the black diamonds add that classy touch. A different spin on the regular circle pendant and can be worn with so many of your other silver pieces. I highly recommend this timeless pendant and know that you will be receiving the highest quality in silver jewelry. Thanks Sonia!